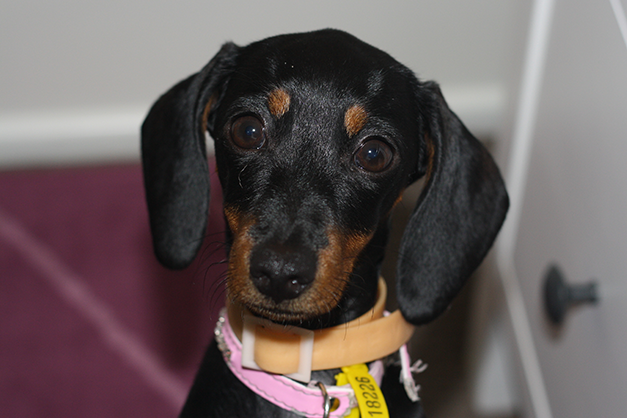 Pursuit of Felicity: Our Miniature Dachshund Ellie is 6 months old! That's right. Princess Eleanor, Ellie, Ellie belly, naughty Nora, smelly Ellie, silly sausage.. whatever you want to call her, is 6 months old today! Weighing in at just 3.1 kg she looks more like she's 3-4 months old, however personality/behaviour wise she has gotten SO much better since those initial few months after we first brought her home when we were wanting to tear our hair out. :P She is absolutely almost perfect and we love her to pieces! 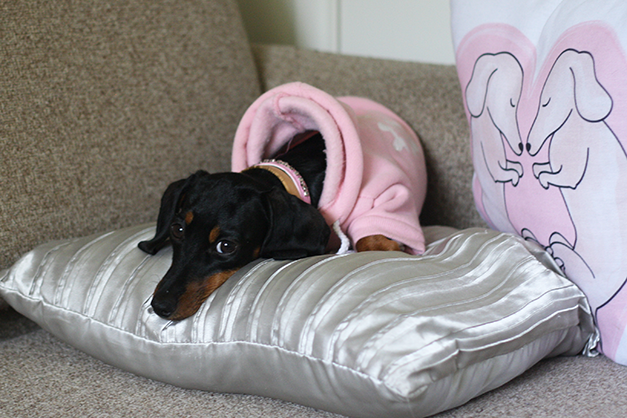 Not too long ago I was inspired by this post of Becky's from Milk Bubble Tea where she shared a few observations about her own Miniature Dachshund puppy, Oscar, at around the same 6 month age mark. Her words had me nodding in agreement - hell, they even had me laughing out loud at one point, but they also got me thinking about all of the random little things that Ellie does that I wish were included in her post.. So, like any good blogger and furmum would do, I have decided to share my own observations here with you today. Enjoy! - Sometimes when I'm home alone (with Ellie) I relish in the freedom of going to the toilet with the door left open (don't judge me). 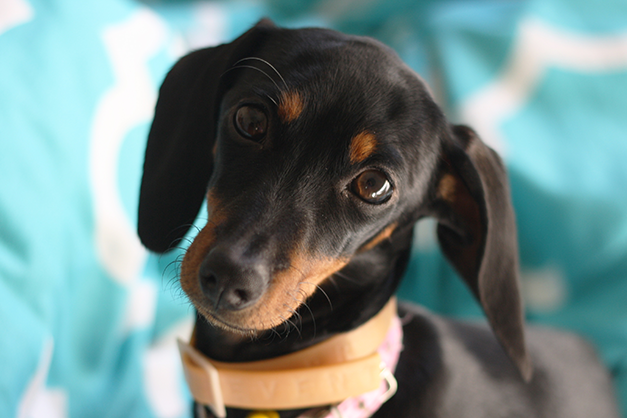 That is until our vivacious Dachshund puppy decides to bound into the room at the very moment that I pull off some toilet paper, snatching it from my hands and running off to another room where I will later find a hundred tiny shredded up toilet paper remnants. They have incredible toilet paper sensing abilities, I tell you! - Speaking of sensing abilities, Ellie always seems to know exactly when you're going to turn around and look at her, and she is always ready and waiting to give you this look..
- Every night after dinner is like psycho hour until you take Ellie to bed. 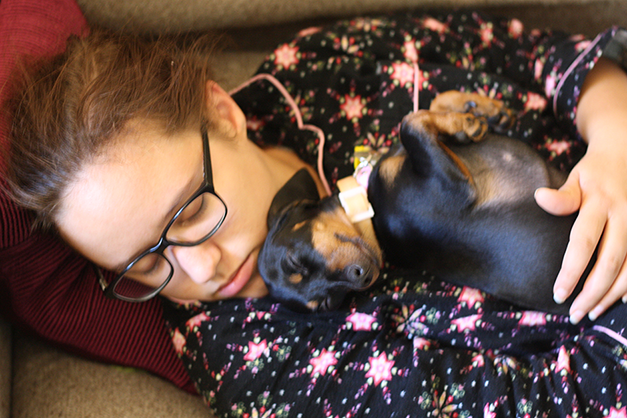 She literally runs around and around the living room at super high speeds, banging into walls, barking at the top of her lungs until she either passes out or gets taken to bed. - One of my favourite things about Ellie is that it doesn't matter if you've been gone for 5 minutes or 5 hours, she is always so excited to see us.. like she thought we weren't ever coming back or something. She always does this funny little dance as well where her long back hunches over and she's kind of spinning around in circles almost. She looks like she is going to do a wee would probably be the best way to describe it actually. - Once I was busy working in my home office when I noticed Ellie wasn't running around causing a ruckus anymore. 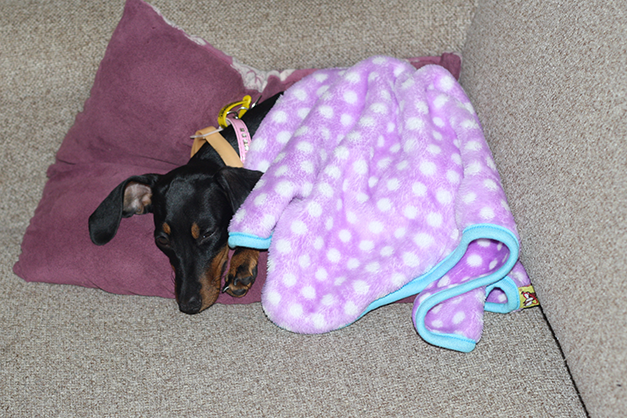 When I went out to check on her I found her on the couch like this, cuddled up under her blanket. Yes, she actually covered herself up with a blanket.. She's a genius! 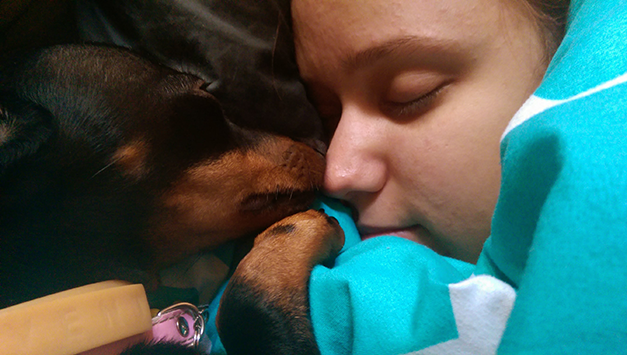 Now to finish this post up, here are some super adorable photos of Ellie and I having a nap together (FYI: you're going to want a dachshund after seeing these photos).. 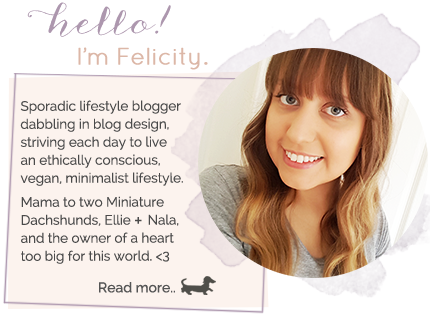 If you want to know more about Ellie, you can read my past blog posts that I have written about her here. YAY Ellie Belly :) Can't wait until more Ellie snuggles! When the man of the house comes home with a pack of special dog treats, he appreciates being tackled affectionately at the front door.